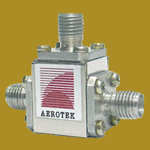 Established in 1989, Aerotek designs and manufactures isolators and circulators covering microwave and RF frequency for telecommunications. We export our products worldwide to all leading system producers such as Fujitsu, Mitsubishi, NEC, Toshiba, SICE, Thales, Thomson-CSF and Alcatel etc. We have focused on customer satisfaction and fulfilled our mission of providing high quality products, yet competitive price and on time delivery. Our staffs are very pleased to work closely with all customers to ensure their requirements and highly satisfaction. Apart from our standard specifications, we also welcome customized designs. Our R&D engineers are dedicated to serve each customer's specific needs. We hire experienced and competent staffs who contribute to our reliable products. All products will not leave our factory until they have been tested to ensure their functions and specifications. Today, we maintain our quality system management which is compliant with ISO 9001 and is certified by RW-TUV. We also put efforts to provide new products and continually improve our resources and performance. Advance search system makes your product search easy. Coaxial Isolators and Circulators High frequency up to 40 GHz.